Four attackers are in a flat formation along the baseline. The first number designates the player who catches the ball in the "catch area" above the elbow (the ball can go through the corner to the catch area if the defence takes away a direct inbounds pass), the second number is the player who gets the guard-to-guard pass. See Inbounds - baseline Tennessee, Corners (zone). 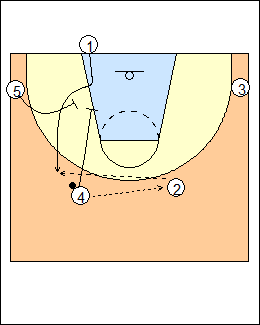 4 and 2 are inside, 4 fakes toward the basket, pops out for the inbounds pass, 2 also pops out, 1 replaces 4. Bill Self - 1 makes a lob pass to 4 then 2 flashes high. 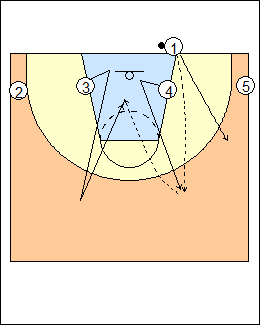 4 swings the ball to 2, 1 screens for 5, 4 screens for 1 then rolls to the basket. 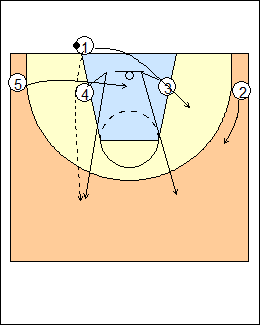 - 1 backscreens for 4, or 4 downscreens for 1 (a traditional flex pattern). See China flex, Slovenia flex, Hoya flex, Poland. Bill Self variation - 1 steps in like he is going to set a flex screen but instead cuts off a double screen from 5 and 4. 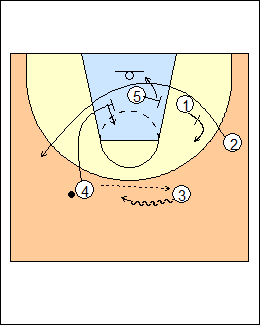 2 and 4 switch sides, 2 gets the inbounds pass, 1 replaces 4. 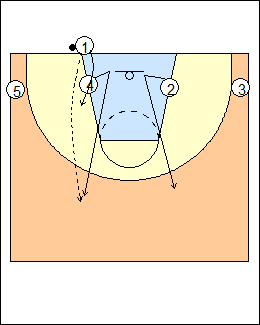 2 swings the ball to 4, 5 flarescreens for 2 then rolls to the basket. 5 slips the screen if X5 jumps out on 2. 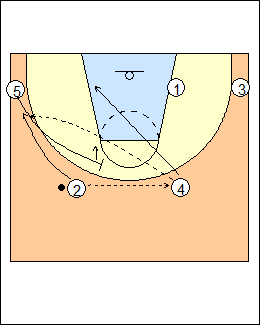 A variation of 24 Weak, after the inbounds pass to 2, swing the ball to 4, 5 flarescreens, 4 passes over the top to 2 and dives to the basket, 5 rolls to the foul-line area after screening. 4 and 3 are inside, 4 pops out for the inbounds pass, 1 comes in behind the arc, 3 pops out then backcuts for a lob pass from 4. The same alignment, 4 pops out for the inbounds pass, 3 pops out, 1 comes in opposite the ball, 5 moves into the lane. 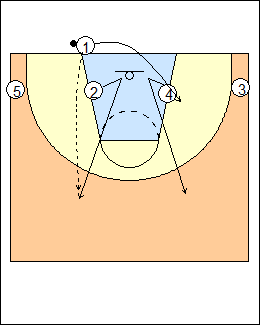 4 passes to 3, 1-5-4 triple screen for 2. 1 and 4 open to the ball after screening, 5 rolls to the basket. 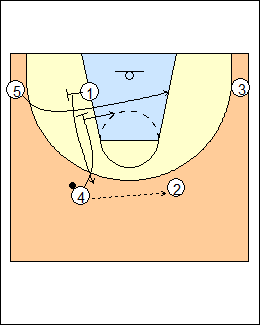 See Inbounds - sideline Box zipper (zipper triple).